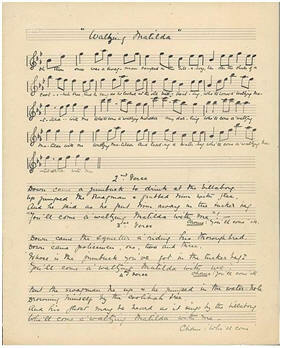 Waltzing Matilda" is Australia's most widely known bush ballad, a country folk song, and has been referred to as "the unofficial national anthem of Australia". The title is Australian slang for travelling by foot with one's goods in a "Matilda" (bag) slung over one's back). The song narrates the story of an itinerant worker or Swagman making a drink of tea at a bush camp and capturing a sheep to eat. When the sheep's ostensible owner arrives with three police officers to arrest the worker for the alleged theft (a crime punishable by hanging), the worker drowns himself in a small watering hole and goes on to haunt the site. The words to the song were written in 1895 by Banjo Paterson, a famous Australian poet, and the music was written (based on a folk tune) by Christina Macpherson, who wrote herself that she "was no musician, but she would do her best." Paterson wrote the piece while staying at the Dagworth Homestead, a bush station in Queensland. While he was there his hosts played him a traditional Celtic folk tune called "The Craigeelee", and Paterson decided that it would be a good piece to set lyrics to, producing them during the rest of his stay. The tune is most probably based on the Scottish song "Thou Bonnie Wood Of Craigielea", which Macpherson heard played by a band at the Warrnambool steeplechase. Robert Tannahill wrote the words in 1805 and James Barr composed the music in 1818. In 1893 it was arranged for brass band by Thomas Bulch. The tune again was possibly based on the old melody of "Go to the Devil and Shake Yourself", composed by John Field (1782–1837) sometime before 1812. It is sometimes also called: "When Sick Is It Tea You Want?" (London 1798) or "The Penniless Traveller" (O'Neill's 1850 collection). In Queensland in 1891 the Great Shearers' Strike brought the colony close to civil war and was broken only after the Premier Samuel Griffith called in the military. In September 1894, on a station called Dagworth (north of Winton), some shearers were again on strike. It turned violent with the strikers firing their rifles and pistols in the air and setting fire to the woolshed at the Dagworth Homestead, killing dozens of sheep. The owner of Dagworth Homestead and three policemen gave chase to a man named Samuel Hoffmeister – also known as "French(y)". Rather than be captured, Hoffmeister shot and killed himself at the Combo Waterhole. Bob Macpherson (the brother of Christina) and Paterson are said to have taken rides together at Dagworth. Here they may have passed the Combo Waterhole, where Bob may have told this story to Paterson. The song itself was first performed on 6 April 1895 by Sir Herbert Ramsay at the North Gregory Hotel in Winton, Queensland. The occasion was a banquet for the Premier of Queensland. It became an instant success. In 2008, Australian historian Peter Forrest claimed that the widespread belief that Paterson had penned the ballad as a socialist anthem, inspired by the Great Shearers' Strike, was false and a "misappropriation" by political groups. Instead, Forrest asserted that Paterson had in fact written the self-described "ditty" to impress Winton woman Christina Macpherson, whose family he visited in January 1895 and with whom he flirted despite being engaged to someone else. It was to Macpherson's melody that he fitted the words of his song. This theory was not shared by Professor Ross Fitzgerald, who argued that the defeat of the strike only several months before the song's creation would have at least been in Paterson's mind "subconsciously", and thus was likely as an additional inspiration for the song. There have been persistent calls for the establishment of "Waltzing Matilda" as the national anthem instead of the current national anthem, "Advance Australia Fair". The song is recognizable and easily sung, but its lyrics, narrating the story of a swagman, the Australian equivalent of a vagabond, render it unlikely to ever gain acceptance in official circles. Many Australians, however, continue to regard it with great affection. It is also partly used in the British Royal Tank Regiments quick march of "My Boy Willie", because early British Tanks were called "Matilda's”. "Who'll come a-Waltzing Matilda, with me?" "You'll come a-Waltzing Matilda, with me". "You'll come a-Waltzing Matilda, with me"
"Where's that jolly jumbuck you've got in your tucker bag?"